Solar PET panel: 18V/10W with the wire. LED bulb: 12V 3W 2pcs with wire and bulb holder. LED usage: Firstly open the lamp switch then insert into the 12V outlet, then switch on the system box, now the indicator shall be in green color. 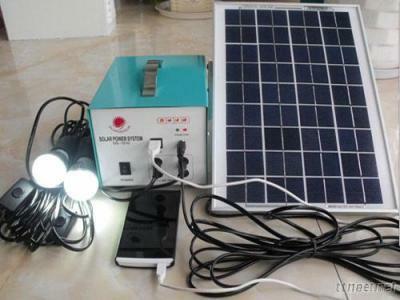 Solar panel charging usage: Please connect the solar panel to solar charging socket. It will be running when the indicator shows red on low-charging or shows green on full charging. For the best effect, you can charge by the 30 degree Angle to directly face the sunlight. Solar panel charging time: about 14 9 hours. Discharging time: one bulb for about 16 hours, four for about 8hours, two for about 6-8 hours. 1 Please do not use in the rain for the control box and LED bulb are not water-proof. 2 Please do not connect the 12V output interface to the sockets of other products. 3 please use the original supporting wire to charge the USB 5V-output mobile phone. 4 Please do not output when in short circuit. 5 The charging input power of solar panel should not exceed 20W/1200MA. 6 The system should be fully charged and discharged if not used for 90 days.